Kyzer McNew, 9, along with other children in the YMCA's School's Out Camp looks at books in the Oklahoma City Thunder's Rolling Thunder Book Bus Tuesday afternoon at the Cleveand County YMCA. The Rolling Thunder Book Bus is part of the Thunder Read to Achieve program and travels to various schools, community centers, parks and museums to promote reading and literacy. 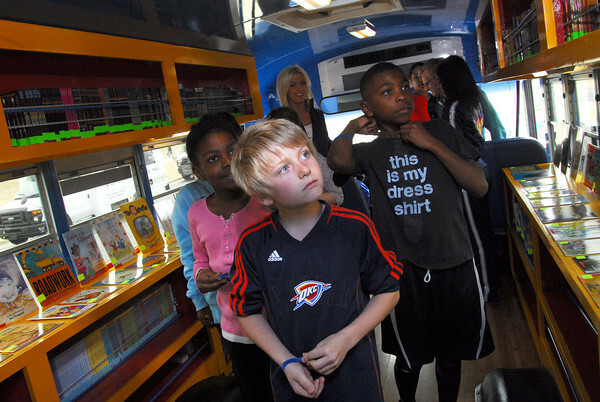 Students were able to pick out a free book from the bus with the help of OKC Thunder Cheerleaders.